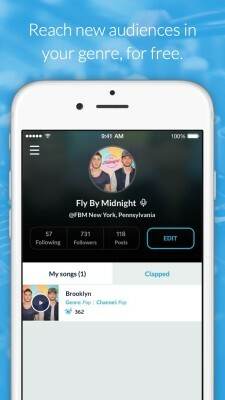 WWhile there has been a lot of hype surrounding streaming services from huge companies lately, SplashFlood has released its new music app giving new talents a different kind of platform to get their music discovered. We talked about our partnership with SplashFlood in a previous blog post, and we’re glad to announce that the app is now available on iOS here. The app was ranked 13th in the Music category in the U.S. in the Apple App Store, and 169th overall among all free apps earlier last week. SplashFlood allows artists to upload and promote their music on the app for free, and for music lovers to discover talent without any monthly fees. You can view the video demonstration for the app at SplashFlood.com. With a mission to prove that real talent can come from anywhere, SplashFlood rewards talent through the app’s interesting Influence Builder feature. So, if you’re an artist, every time you listen to and rate a song, one of your songs in the app gets listened to and rated by another artist of the same genre. The Influence Builder gives artists the chance to get their music heard and validated by other artists, and helps to increase their exposure to other listeners alike. As an artist, you’ll also receive Splash Points for every positive rating you get. The more Splash Points you earn, the more likely your songs will make it on one of the app’s Featured Channels to attract even more listeners. Songs on the Featured Channels are also promoted to all users of the app. There are no monthly fees and the app is free to download as well. SplashFlood is now available on iOS in the Apple App Store at this location.